The PaxLair Press, Chesapeake (PaxLair Times) – September 16, 2013 – by Ashlynn – Official Crown business dominates this issue of the Times with the results of the most recent election as well as a report on the weekend’s Royal Council meeting with the King. Meanwhile in the sinister realm of Malas something was found stirring at the bottom of Gravewater Lake. While only one candidate stood in most towns, Moonglow, New Magincia, and Britain were all in contention as candidates battled for office. In Moonglow Lady Lauren saw off challenger Bastian Windsong and retained her Governorship. Gareth of New Magincia also saw off a challenge from Ceridan, while in Britain new comers to the race Sarberius and Dark Writter battled it out with the former eventually securing victory at the last minute. Despite my own vocal protests here at the Times over the treatment of Cove, the town was left out of the race. Almost immediately following the recent elections the King convened the council of Governors to hear requests and welcome newcomers to his table. Much time was taken up with introductions and talk of previous business such as the Vesper Beautification Project and the construction of a dock in Minoc. The Trans-Britannian Racing League and their penchant for leaving behind enchanted litter was also mentioned with the King suggesting it would be seen to. One highlight of the meeting was the Trinsic “Feed the Needy” Project being launched by Lady Phoenix. The project involved the growing of Yams with help from Tokunese botanists in an effort to secure the Trinsic food supply. More details would be forthcoming at the next council meeting. It should be noted that during the meeting Governor Gareth of New Magincia was drinking heavily. The King stated that while no rules on drinking had been previously mentioned, he expected his guests to remain sober next time. Let us hope this is not a sign that the New Magincian Governor is an alcoholic. I have already heard rumours that the city was making moves to become the liquor making capital of Britannia. Once all business was finished in the council chamber the King ushered everyone outside to see the uniforms for guards of the nine cities of Britannia. I must say the Royal Quartermaster had avoided any flamboyance and ensured the uniforms were tasteful and practical though my thoughts were on another topic that evening. Over the weekend Governor Victor Speranza of Minoc organised a craft fair in order to draw the best smiths of Britannia to the famed mining town. What followed was a mythic battle of hammer and anvil as smith faced off against smith, furiously hammering iron and steel and grimacing threateningly at their opponents. The competition was simple. The guards of Minoc needed plate uniforms and competitors would need to make them with only 100 ingots a piece. While some might cynically believe the whole event to be a ploy to fund the impoverished local militia I was assured that the competition was concerned only with shining a giant bullseye lantern on the best armourer in the realm. The past weekend was a busy one for the alliance with meetings and craft fairs and terrible haunted wrecks found at the bottom of dying lakes. The lake in question was Gravewater Lake, the fading lake slowly drying up (or falling into oblivion) in the lands of Malas. After hearing word of this strange wreck members of the alliance were resolved to investigate. But there was one thing standing in the way – the wreck was deep underwater. It turned out however that in the realm existed those with knowledge of constructing vestments that would allow one to breathe underwater and pierce the aquatic vale. What followed was a long journey that started in Trinsic and involved performing a service for several different people to acquire the attire needed to brave the wreck. Once diving gear was in place our band stood on the banks of Gravewater Lake and dived into the water, heading for a partially submerged wreck at the centre. We then made our way down into the depths. 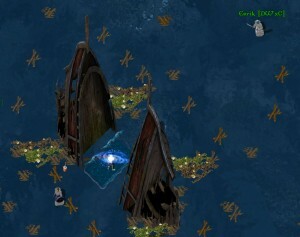 Below was an enormous sunken wreck inhabited by monstrous seaweed and other aquatic horrors. However the worst was still to come as it was discovered one of the infamous Shadowlords dwelled within the wreck. A huge battle followed with many casualties but our mighty alliance warriors soon prevailed. Sadly despite some serious battle wounds we had little to show for our efforts except the knowledge of knowing we had faced one of the Shadowlords and emerged victorious. 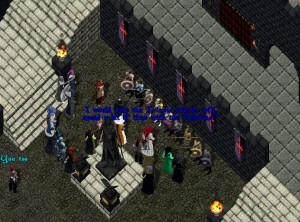 Lord Tehan has begun hosting the weekly Walk of the Eldars – expeditions intended to highlight old and forgotten places in Britannia. These will take place at 8pm on Mondays. Aspiring expeditionaries should muster at the Tea House. The Vesper Beautification Project will begin this Thursday at 9pm starting with New Magincia. Join Lady Ivy as she plants stolen seeds in an effort to make the place look pretty! 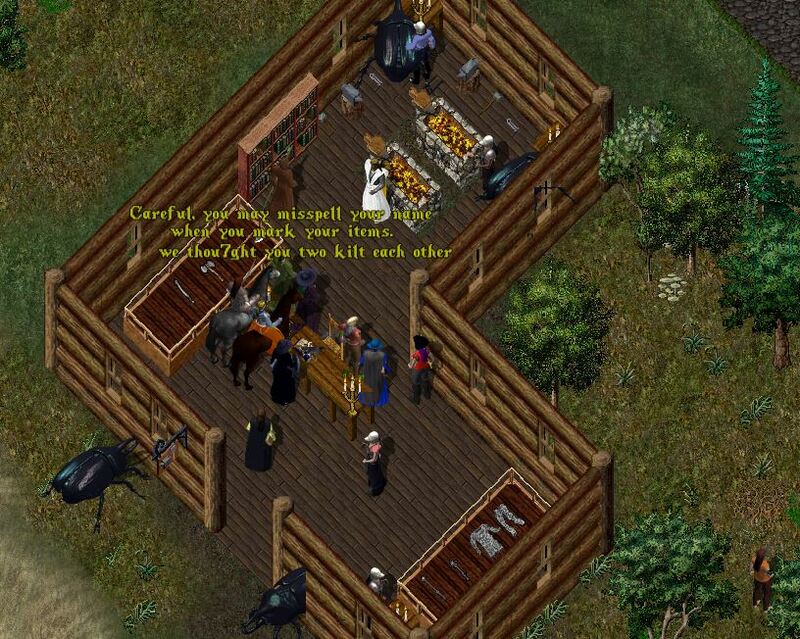 This entry was posted in Britannia Towns, Dungeon, EM Event, General News, Governor Elections. Bookmark the permalink. I quite enjoy the new guard uniforms. Unfortunately Minoc’s virtue color is Orange, but it’s a sacrifice I’m willing to take. I will be contacting the Royal Tailors with more color information as at the moment, it’s not up to Minoc’s standards.